Mario Rizzotti is a Chicago-based Italian culinary expert, brand ambassador and television personality. He most recently served a judge on the Food Network’s Iron Chef America. 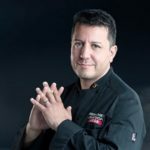 Mario Rizzotti was a judge on the Food Network’s Iron Chef America program, and a brand ambassador for Academia Barilla. He goes around educating people everywhere on authentic Italian foods. He joins us today from Chicago. Good morning, Mario. How are you? Good morning, Curtis, and good morning to all the listener. I’m doing great. I’m doing wonderful. I had my little shot of extra virgin already, so I feel good. Are the Cubs going to pull this one off or what? You’re talking to the only person in the whole Chicago land that wishes that they will, but he does not understand anything about baseball. Therefore, I wish them they will, and it’s something that Chicagoans have been waiting for years and years and years, so I will see what happen. Yesterday, they didn’t play bad, I heard, but, again, if you ask me something or if you pull me in front of four Cubs player, I have no idea who they are. Well, stranger things have happened. They need to win two in a row. We’ve seen that happen before, so it’s okay. What is it with Italy and these horrific earthquakes? That is the last thing that I’ve been reading. I finally been able to get everybody accounted in my families. The last thing I’ve read is that there is a new theory that is mentioning that the Apennines Mountain are about to split in half or something is growing up in the middle. According to some of these seismologists, this is not going to be the last one we hear. It’s not the first one either. It’s been a lot of them. Yesterday, we have the highest 6.6 earthquake at Richter Scale that we never had since forty years ago, so it’s not looking great. I do a lot of things also here in Chicago to raise money to send them to Italy. We’ll see what happens and what I can do for them, like I did a few years ago for the Abruzzo earthquake. Tell me what you did. For the other earthquake, we have done an event in the restaurant in the suburbs of Chicago where we invited everybody to support this great cause. We had between the top chefs in Chicago starting from Tony Mantuano to Jimmy Bannos to Gale Gand, they all joined forces together with us and our cause to raise sixty thousand dollar in one night. We did a beautiful event. We had Italian singers coming by. Everybody donated their time for free for this great cause, and it was definitely appreciated. Fantastic. Where in Italy are you from, Mario? Originally, I was born and raised in Roma, Italy. For the listener, Rome, but I stopped saying Rome because there is a couple of them in the United States, so, therefore, Roma, Italy. Then after my father passed away, we buried him in this small town called Gaeta, which is actually very famous for olives. You might heard before, I’m pretty sure you’re very familiar with Gaeta olives. That’s where my father is buried, then my mom after that. They came there. I came from Rome originally. What was it like there growing up? You’re living in a country that has thousands of years of history. You walk around, and everything around you, if you touch it, or if you just get close to it, and if you close your eyes, you really have the impression that that specific building, or that specific area, or those roads have been built thousands and thousands of years ago, and they’re still standing. It’s an amazing experience, and plus, the Italian experience that we always live every day is amazing. We definitely have a good time. We enjoy our life. We live. There is a famous joke about what Italian talk about at lunch, and we talk about what we’re going to have for dinner. Therefore, it’s just the idea and the whole concept, or enjoy our life over there, is amazing as well. That’s why I also came over here, because I want to have people to know more about the authentic Italian experience, the extra virgin olive oils, all the ingredients that we use in Mediterranean diet, that are also part of the tour that I’m taking around right now which is called For the Love of Italian Food. We’ll get to that in a second. What was food like in the Rizzotti household in Rome? Having a mom that was from north of Italy and a father as well, and living in Rome, we get to taste every different kind of cuisine, which, as you know, is not only southern or northern Italian cuisine. Italian cuisine is more regional, is more individual. Every Sunday there would be different kind of, I’ll call them more, a dining experience more than a feast, because, as you know, authentic Italian food is not served in humongous portion and there is no sauce flooding everywhere. It’s just a little different experience that we had. The good thing is that being with mom in the kitchen and learning all these little tricks, that was actually intriguing because look where I am right now. I’ve been able to take those experience, those cookbooks, those ideas, those little tricks. I’ve been able to take them here and put them to work to educate people in this beautiful country to understand the difference of authentic Italian cuisine and Italian-American cuisine. What was your favorite dish that your mother cooked for you? Risotto was always a favorite one. It was a long process, and we were in charge of it, so definitely one of them, but she made excellent pasta all the time. You cannot go wrong with my mom’s pasta, and, believe or not, the little Pollo alla Milanese, that was one of my favorite. Just a little nice, well thin pounded chicken breast, lightly breaded, served with fresh lemon, and a little bit of [arugula 00:05:32] was a the hit for all of us. Sounds delicious. You try to do that still? You try to make that like your mom made it? I try to stay hundred percent faithful to her recipe. Ingredient wise, I try to find as much as I can Italian, authentic Italian. If it’s not, then I just try to adapt myself to whatever I can find around here. The flavor profile is never going to be like your mom, but that’s always good to try. You came here when you were in your twenties? I came here when I was twenty-one. I just came for fun, actually. I came for fun, and I came to actually see a friend of my brother. My brother was working at this small restaurant in Glenview. I came by and, funny enough, I noticed that this gentleman owned a restaurant. I was looking at the food that was served. I was shocked to see that it was called Italian food, but had almost nothing about Italian. That intrigued me to start to figure it out, what can we do to make sure that people understand the difference of these two great cuisine? I love American-Italian cuisine, I love Italian cuisine, but, as you know, there are probably a lot of differences culinary wise, between the two. Then I decided to stay. I decided to start to learn a little bit more about the restaurant business. I decided to enjoy educating people on understanding the difference of this two kind of cuisine. You came here and your first job in the food business was what? Dishwasher. I was washing dishes in a restaurant in Glenview, and then, little by little, I worked all my way up. I didn’t come here to remain a dishwasher. I became then a busboy, then a runner, then a waiter, and then I worked all my way up to the chain. It was a very great experience also because working in the kitchen as well, which I worked behind the line cooking and serving and getting burnt to make sure everybody were happy outside in front of the house, was something that made me proud of what I was passionate to do and what was actually coming out of my heart straight into the dishes. What is it about the food business that hooked you in? Curtis, you know better than me that the food is the only way to bring everybody together at the table. That was number one. That was one of my passion. As you have a chance to go to my webpage, which is mariorizzotti.com, you can see that there is a motto there that I strive every day to educate everybody off of it. The motto is very simple: A meal in Italy is not just a consumption of food, it is also a celebration of Dolce Vita. The good thing is that we like to see people sitting all together at the same table and enjoying. That’s what brings food around is friendship, love, family values, and more. Tell me about how you became a judge on the Iron Chef America program. That’s a wonderful story that I’d like to share with everybody. Years ago, I was also an olive oil taster and a balsamic vinegar taster as well. I was actually working for Academia Barilla at that time. I was at the house of a very famous chef that happened to be Oprah Winfrey’s chef. His name was Chef Art Smith. Art was getting the education on olive oil, how to taste it professionally without the bread, showing him all the little tricks with the blue glass, and then the tasting techniques, and how to slurped the olive oil, and so on. One day he had a party at his house where we actually were launching a product for Giada De Laurentiis. At his house, he was kind enough to bring in front of another gentleman to try to get me to be a judge on Iron Chef because of the passion that he saw about my cooking, about my passion for Italian products, and about olive oil as well. This gentleman happened to be the vice president of the Food Network at that time. That opened up my door. About few months later, in July, I was asked to do the first episode on Iron Chef. Then, second year, I got two episodes. Then the third year, three episodes. Then six years gone, and there are six episodes every season, and happy enough to be called being actually not a Food Network talent, but just being a person with a lot of passion for food, and for Italian food as well, and Italian olive oils. Here I am sitting at Chelsea’s Market in a chair as a judge of Iron Chef. What is the day like when you’re going to the set to be a judge on Iron Chef? What it’s like? What’s the experience like? Being a judge on Iron Chef is not simple like other people like to think. You wake up early in the morning. There is two tapings in the same day. You wake up early in the morning. You got to be in the studio by 8:00 in the morning, after you’re done with your makeup, so you are already on stage by eight, and then the whole taping last almost six hours. Therefore, the funniest part is actually that there is a lot of behind-the-scene that people don’t see it live. The real battle really happens in sixty minutes, but everything else around takes a long time to get organized. When you do two episodes back-to-back, that means you’re spending an average of twelve to fourteen hours in studio. Trust me, that’s a long day, but just to be there, just to see that people are sharing with me the same passion when they cook those dishes and they put heart and soul to try to portray it, the secret ingredients out there, it’s amazing. It’s just an amazing experience that is not easy, but it’s got a great wonderful results inside you at the end of the cooking. Where do they shoot that? That one is shot at the Chelsea’s Market in New York City. Oh, okay. Do they pay you for that? They take care of us. They do take care of you. Remember that one? Which one was your favorite? My favorite was every time that they had me in for an Italian ingredients or with Italian chefs. Battle of branzino was great. I really enjoyed that one. Battle of Parmigiano-Reggiano, twice, was amazing. Mario Batali was in one of them. Mario Batali in battle of Parmigiano, yeah, but it was very, very, very, very close. We did battle of lemon with twins from the Carro brothers from Miami. There was battle of quail. There was battle of mozzarella. Battle of rice [sold 00:11:58] authentic Italian ingredients that [could 00:12:01] be around. I was actually asked to judge because of the expertise that I had as an Italian culinary specialist. They never did the battle of extra virgin olive oil, did they? Unfortunately, no. They did the battle of balsamic vinegar. Battle of extra virgin olive oil would have been fantastic if they could have done it, but you know better than me that if they bring the wrong extra virgin olive oil on the wrong dish, they would probably completely destroy the dish. It is a culture, as you know better than me, that is needing a lot of education, a lot of attention. We are still at halfway to where we need to be to make sure that people understands the difference of it. I’m not even sure we’re halfway. You meet a lot of chefs out there. You’re out there a lot, Mario. I see you online and going to events throughout the country, food shows, demonstrations. How many chefs do you come across that know what to do with a monovarietal extra virgin olive oil and pair it with a right dish, or how to dress original Italian dish properly with just the right olive oil with a right profile? You see other people who know what they’re doing with that? I have to tell you that, first of all, with the help of Internet and the help of social media and the help of the Food Network and all these other food channels, there is definitely more knowledgeable out there, more knowledgeable chefs out there, than we had twenty years ago. Definitely, it’s very hard to have chefs that they know what to do with the Monocultivar Olive Oil as we want it to see, but, definitely, there is a lot more passion out there. There is a lot more request to learn more to make sure that what they have in their kitchen, it is definitely the valuable liquid gold that they were looking for to finish up their dishes. I think that the concern shouldn’t be the chef’s knowledge as much probably as the consumer knowledge. That is the main important part that we need to target out there, because if the consumer is not aware of the difference and the cost of it, it will be very hard sometime for some chef to make sure that we can adapt to what exactly they want to do. Where do you buy your olive oil? They ship it to me every day, Curtis. Got olive oil in the front of my house FedEx from Europe every single week, I’m telling you. It’s funny that you mentioned that because the last time that I bought a bottle of olive oil was after reading an article on the Olive Oil Times. There was an article about Croatian olive oils that they were actually becoming very well respected and very higher quality throughout the world. I was in Croatia at that time. I actually ended up to buy some great Croatian extra virgin oil and bring it back home and applying it to the Italian cuisine that I do at home. They were amazing. I think one big, huge misunderstanding of the consumer is the fact that there is no such a thing as the best country that makes the best olive oil. I think every country has its own best olive oil, number one. Number two, you cannot compare extra virgin olive oils from different countries, especially when they are now made with the same olive, at least. Number three, the way that you can apply a great Croatian olive oil to certain dishes and then you’re not going to be able to apply it to other dishes is the same for other country’s olive oil, Italian, Greek, Spanish, Portuguese, South Africa, Tunisia. They’re all doing a great job. I think this Croatian olive oil, after reading your article, I was very happy to see that there was a truth that I was not aware of it, and I was impressed. Aren’t we fortunate that there is such a variety of cultivars and regions that produce different extra virgin olive oils that you can tap depending on what you’re eating and what you’re preparing? [Culture 00:16:07] cooking, yes. As a matter of fact, some of them, as you already know, and some of the viewers might be aware, some of them are very bittery and peppery. It really actually have very small applications out there, but when you use it with the proper ingredients, it’s just a win-win situation, a marriage happening on a plate that is very hard to break up. Where did you learn how to taste olive oil? I’ve done it through the Academia Barilla when I was working for them which, unfortunately, Academia Barilla is no longer in there business-wise. One of the gentlemen was [Ricardo de Santis 00:16:43], was one of the guys. I also did have the pleasure to work with ONAOO in Europe as well to try to get the certification. The passion that came from them was amazing because, at the beginning, I did live in a city, after my father passed away, which was called Gaeta, where they make the Gaeta olives. They do also an excellent olive oil, but I was not aware that all these olive oil could have a different flavor profiles. I was intrigued to learn a little bit more of all the difference of it. That’s how and where I learned from to taste extra virgin olive oil professionally. I know you have some kids. What do you cook for the kids? Do you use olive oil when you’re cooking for the kids? It’s amazing to see how they like to use it on top of their dishes, on top of their salads, on top of their meat, and also to dip their bread in, which is something that I don’t dislike at all as long as they enjoy some healthy extra virgin olive oil. As you know, it’s been part of the Mediterranean diet. I’m not doing anything bad to give them some good extra virgin olive oil. They put extra virgin olive oil. That’s great. They ask for a little dish so that they can dunk the whole thing in extra virgin oil. It is education. It’s education that they hear from you all the time and from all of us that we’re very passionate about extra virgin. I guess that you created your- you know already, your kids, they’re going to probably follow up your business, I guess. I don’t know, but they certainly do know a thing about olive oil, and they know what they like, and they know what they don’t like. They like a little bit of a kick. They like it fresh. If it’s not fresh, these young palates instantly respond to it. Yeah, they have a fantastic trained palates, probably through us as well. It’s amazing to see when the little one is six years old that still doesn’t know how to use the proper word, which is bittery or peppery, but he comes to me and he say, “Papa, this olive oil from Tuscany, it’s spicy, but I like it.” It’s nice to see that they recognize those flavor profiles as well. What’s the food like in Chicago? Do you know the chef, Paul Bartolotta? Yes, actually, I know Chef Paul Bartolotta very well. I happen to already have him as one of the [contendents 00:19:54] on Iron Chef in one of my very first episodes, battle of rice, which was Paul Bartolotta against Mario Batali. Paul has been a friend for many, many years. Last time I checked with him, he was in Las Vegas, E Ristorante Di Mare, but the Ristorante Di Mare now has a new name, so I don’t know where he’s going next, but he has some nice, successful restaurants also in Milwaukee. Another chef who has taken the time learn about olive oil. Oh, yes. He actually was on the Jimmy Kimmel Show in the past. He was always portrayed in this very good extra virgin olive oil that we used to produce and import through Academia Barilla. It was a Monti Iblei extra virgin olive oil from Sicily made with the Tonda Iblea olive. It was amazing because when you open up a bottle of their olive oil, the only thing you smell is tomatoes right off the vines. It was an amazing experience just opening up the bottle. He always brought it with him. He was probably in love with that olive oil. Many things, but the main important one is my food tour. I’m trying to educate people throughout the country about authentic Italian ingredients and authentic Italian foods, so, therefore, an authentic Italian cuisine. I create it with the help of my very good publicist, Karen Fleming. We created this tour. It’s called For the Love of Italian Food, which is four cities, four restaurants, four events. For the Love of Italian Foods. We do four courses, we do four wines, and we pair with four olive oil. We’re trying to do the best to travel throughout the country to understand if people really know the difference between American-Italian cuisine and authentic Italian cuisine. They’ve both very good, but, Curtis, if anyone of the listener, or yourself as well, have been to Italy, you’re pretty much aware that there is a lot of food in here that is not Italian, and they call it Italian food. We don’t have the fettuccine alfredo the way that they make in here, the chicken vesuvio, the meatballs on top of pasta, marinara sauce, Italian beef, Caesar salad. Therefore, I just want to make sure that people understands what we have there versus what it’s portrayed here, which it was done by Italian-American ancestors. They cooked for a necessity to feed five, six, seven kids, or their friends, and they adapt themselves to whatever ingredients they found around here. The tour has actually been very successful. We’ve been traveling in, not in the main cities, because we’ve been traveling in cities where Olive Garden probably is the best Italian restaurant they have, so to make sure that people understands a little bit the difference of what’s real and what’s fake. The results and the response is amazing. The ambition is to maintain the cultural integrity of Italian dishes and to celebrate authentic Italian cuisine. And living a lot longer than we do here, too. That’s another factor. It’s all because also the way that we enjoy our cuisine and the way that we enjoy our food, as I mentioned to you, is a dining experience in Italy is two to three hours long. Over here is twenty to thirty minutes. It’s then there is a necessity. People are in a rush, but we don’t have to forget about enjoying the food. It’s not about just swallowing the food. It’s about indulge yourself and actually have a great time when you actually get a bite of- get those flavor profile burst in all over your mouth and see what four, five ingredients have been able to do, instead of fifteen, twenty ingredients. The portion size that I show everybody, as you already know probably, Curtis, that our portions are big enough to make sure you are satisfied. In Italy, we don’t have to go containers. Therefore, you understand that. When you’re out there doing these events, Mario, and you’re talking about olive oil, how do people respond? What is it like? It’s funny that you asked, Curtis, because it is nice to see the results at the end and to get all the emails of people that they are amazed, that they went back home and they taste what they had in their cabinet, and it was not what they expect it to have in their house. It’s funny because I bring out my blue glass to do the tasting, and I show them how we do the tasting. I give everybody for convenience a one ounce olive oil, a little container with the one ounce olive oil in it, to do the tasting. Everybody sees this shot glass and they think it’s tequila inside, or sometime they think it’s limoncello. Then, when they start to do the little sip in and they start to feel the bitterness and the pepperiness towards the end of their throat, it depends from the fruitness of the olive oil, they’re actually looking at you like, oh my god, this guy wasn’t joking, there is a difference between these three olive oil that we tasted, and it’s amazing to see how can we pair them with different things. When I tell them I got ten olive oils in my house, all different, because I use each one of them for a different application, at the beginning they laugh at me, then at the end, it goes like, oh my god, now, I understand why you say that. It’s great to see it, and I always invite them and to go back home to do a nice olive oil parties with friends and tell them how to taste olive oil professionally. I receive a lot of email, Curtis, that they are all thankful. Just says, thank you very much, I’ve been going buying olive oil in the specific olive oil and vinegar shop, and, oh my god, I understand now the difference between this and this and this. It’s good to see that they’re listening. It’s good to see that they’re willing to learn. It’s good to see that they’re spreading the love for extra virgin olive oil throughout the country. Good for you, Mario. We need more of that, more education, more passion, and more truth about this important product. I am very glad to know that you are doing that every day. I wish you good success continuing with that. I hope we can keep in touch. I have one more question for you. Before you get to the question, very quickly, and let’s launch right now a new campaign, Curtis. Let’s invite Oprah Winfrey, Ellen DeGeneres, and Jimmy Kimmel, and anyone on their TV show, to have us there and show millions of viewers how to do it. They will be impressed themselves and they will be actually the one that could help us spread the love for extra virgin olive oil and the love for Italian food through these wonderful media outlets. Sure. You have their phone numbers? They’re going to start to see us over here, and then we’re going to do probably a few more. We’re going to do some videos if you want, and we can send it to them. Hopefully, we’d be there one day, Curtis. It would be a great pleasure. Who are you voting for next Tuesday? According to the media training that I took, I would like to answer you back [inaudible 00:28:06]. I’m so proud to educate people about olive oil, and that’s just the reason why I’m on the show. On the other end, may the best win. May the best prevail. May our country have the best choice that we can possibly have, because I traveled throughout many countries, and one thing, Curtis, I’m very tired of it and hearing people complaining how bad America is. I’m tired of that. I’m a foreigner. I’m American citizen right now as well. If only people would have the chance to travel throughout the world, to go taste some olive oils, and have their experience over there, and come back, the first thing you do when you come back to the United States, you’re going to kiss your land and say thank you very much. This is a beautiful country. I hope the best will prevail. Curtis, thank you very much for having me on your show. It was a pleasure to see that I’m not the only one out there sharing this love of extra virgin olive oil. Now, I have a question for you. Am I allowed to ask you a question? Well, then, I want to be the first. There you go. What actually triggered you to become so passionate about extra virgin olive oils and creating the Olive Oil Times on olive oil? What was the passion that got you there, and why did you actually get yourself into such a big crusade because, as you know, we are sharing the same crusade of educating people about extra virgin olive oil throughout the world? This is your podcast now, Mario. Oh, it’s yours, but you’re the best, so you can do that. I started a personal blog a long time ago in 2009, a personal blog because everybody was blogging back then. Everybody was sitting down and writing something and posting it online. I thought it would be fun because I traveled in Europe quite a bit in those days, especially to France and to the south of France. It was there that I came upon for the very first time these olive oils that I tasted. For the first time in my life I had this experience of tasting extraordinary local fresh olive oils in Provence. I had never tasted anything like that before in my life. When I went back to New York, I noticed that I couldn’t find those olive oils that I saw in the south of France anywhere. I began to scrutinize and compare different olive oils that I was able to find out there in the market. I started a personal blog about that, but, almost immediately, I realized that there was no information about olive oil online. I thought that this topic, as I learned more about it and its intricacies and its complexities, I really felt very quickly that this deserved a serious journalistic approach. I went on to hire writers in olive oil producing countries throughout the world and put together this kind of news approach to this topic, the business side, the culinary side, the quality debates, and just open it up to discussion. That was Olive Oil Times. I also have always felt that if you have a good idea, it doesn’t need much pushing. The best ideas don’t need much pushing. From the very beginning, Olive Oil Times didn’t need a lot of push. This was reflected in the growing readership. From the very beginning my motivation has been the expansion of the audience that is tuning in to learn about this, to learn about olive oil, the importance of olive oil quality, the health benefits. That was 2009, 2010. Since then, our readership has expanded. We’ve moved into other activities like the New York competition and the educational outreach. Those are the three important parts of what I do. That was a great question to ask. Nobody ever asks me that. For me, it’s a business, but it is an extremely interesting topic to explore because you have so many different intricacies of it. It’s all being driven by the health benefits. This is why we’re here. I say that a lot. We’re here because of the health benefits of olive oil. Number two is its culinary application and the way that it can enhance our enjoyment of foods. Of course, number three is the cultural aspect of it which has been here for a very long time. For those three important reasons, it makes it a very interesting topic. Guess what, we are both, as I told you, into this crusade, which the enemy of our crusade, I think, is the ignorancy acquired by mistake from the Americans, from people that they thought they knew everything about olive oil and everything else, and they didn’t. We’re going to have this job for quite a long time. I think so. I hope to see you out there. Let’s keep in touch. It would be my pleasure. Just every day, I think that if somebody is going to do a blood test on me, they’re going to be trace on blood in my olive oil. Keep up the great work. Thank you very much for helping all of us to try to get to this educational point. I say what it comes up from my heart.